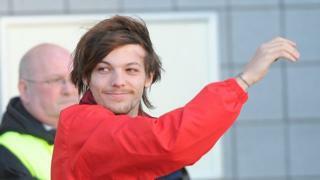 One Direction's Louis Tomlinson has made his debut for Doncaster Rovers' reserve team in a South Yorkshire derby against Rotherham United. Local lad Tomlinson joined Rovers on a non-contract basis last summer but this was his first match. More than 4,000 tickets were sold for the charity match, when usually they would only sell around 100. Fans had to wait for the 65th minute of the game, which was a 0-0 draw, to catch the star in action but did not seem too upset, even when he fell over attempting a pass in the 89th minute! Well, we want to know which famous face you would have on your team and why? I would put The Saturdays on my team because they would be good fun and a laugh. I would want Taylor Lautner to be on my team which is MUFC! I would love Jessica Ennis-Hill to join Arsenal because she is really quick. Plus I am her number one fan. I would like David Tennant and Matt Smith to play for Liverpool as they are awesome legends! The celebrity that I would want to be in Manchester United is Johnny Depp. He is a very funny actor and I am a massive fan!! I would have Bradley Cooper play for Chelsea, as he can bring a bit of attacking football and score goals. Doc Brown because he is very cool and he will defend like crazy! I would have Zayn Malik in my team because he is really good at tackling but I wouldn't want him to leave 1D. Mine would be Olly Murs because he is fast and has some tricks up his sleeves. That's easy, definitely Taylor Swift! She is AMAZING! I love all her songs! I think that Niall Horan should definitely join our football team, because I have seen him play football before and he was quite good at it. I think it would persuade more girls to play football, and I am one of his biggest fans. I would have Hacker, Dodge and Shaun the Sheep! I'd like Ant and Dec to join Buxton. I think Niall Horan should join Chelsea football club because he lives in London with the other 1D guys. I would have Niall of 1D at Manchester United because I like Manchester United and Niall! I would LOVE Harry Styles to be on my team because he is really cute and he is awesome! I would like Harry Styles on my team (Tottenham) even though he is rubbish at football! The celebrity that I would choose to be on my footy team would be Sooty from the sooty show. I would want Pharrell Williams and Simon Cowell to play for Bristol Rovers because Pharrell Williams looks 'happy' on the pitch, and I would like Simon Cowell to be the manager because he is bossy and gives good advice.